As a freelance writer, I make most of my money from my writing. This comes from various sources. Along the way I have picked up a number of customers which ask me to write articles for their websites, blogs or forums. They tend to send me work on an adhoc basis, but this can add to my monthly income. I find them either through personal recommendations or the site below. This is a forum where you can buy and sell items including articles. I tend to write fun articles and put them up for sale here. I sell them a bit cheaper than my going rate and sometimes pick up regular customers or otherwise sell articles that have taken me very little time and been fun to write. I have written a selection of ebooks and I sell these on Amazon and other ebook websites. I sell the Amazon ones directly through Amazon and use a website called Smashwords to sell to other ebook sites. I get paid monthly by Amazon and Quarterly from Smashwords. 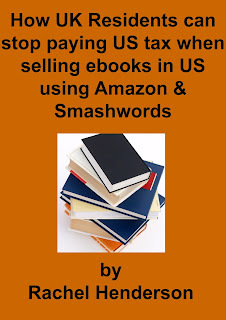 Initially I used to have to pay a lot of US tax on these earnings as Amazon and Smashwords are based in the US. However, I have now managed to get a discompensation form paying the tax from the IRS, after sending a series of documents to them. Thsi was a complicated process but paying 50% tax on my earnings to them and then being taxed in the UK as well, was getting beyond a joke! I have even written a short book on how to fill out all of the documentation to avoid paying the tax!